Better late than never, but I finally got a chance to write about the Sephora VIB Rouge Spring Social Event that was held at the Union Square Sephora in San Francisco. Arriving a tad early for the event, I grabbed a Cappuccino from the Blue Bottle in Mint Plaza and waited for the doors to officially open. Little did I know, Sephora was providing breakfast pastries and morning refreshments, but I was very content with my Blue Bottle delight. As soon as I walked in the door, I saw a hair stylist brandishing the signature Drybar buttercup yellow blowdryer. I immediately walked up to him and said a very cheery hello. I’m a huge fan of Drybar for nights out or even just for a pamper day to myself and I’ve raved about their products/services in earlier posts so I was very excited to see them at this event. I had had no time to shower that morning so my hair was tossed up in a sockbun. The stylist kindly offered to give my hair a style refresher and I gladly took him up on it! I got to try out the Drybar dry shampoo, which has now become my go to favorite, especially when I travel. He styled up my hair, giving me some beautiful loose curls with a nice lift on my bangs, all the while, giving me great haircare tips and tricks. After my mini blowout, I sat down in a lovely swivel high chair to get a mini makeover from one of the Dior makeup artists. I have only ever owned Dior eyeshadows, mascaras, and lip glosses so I was excited to try out their skincare products and foundations. I loved the look that the artist gave me, which was perfect to rock day or night. I was really excited when I finished my mini makeover to go do some shopping. Courtesy of Sephora, each VIB Rouge Member received a black and white striped makeup bag filled with samples. I loved the stripes and the red accents so this has become my go to travel makeup bag. It’s on the smaller side so it makes me really consider what I NEED to take with me when I travel. I also picked up the Cover FX Bronzer in Suntan. I really needed a new bronzer and I had read such great reviews online about this particular brand. All of Cover FX’s products are clinically tested, vegan, and free of parabens, fragrance, gluten, mineral oil, and talc, which means they are great for those with sensitive skin like mine. The color blends beautifully, even on my light skin. The second thing I grabbed was actually an impulse buy after I had chatted with the Drybar stylist. I can’t believe this, but I don’t own a large round brush. After seeing how awesome the stylist made my hair look with the Drybar Full Pint round brush, I knew that I needed to have it for my everyday styling needs. The whole event was so much fun! I got to explore the store and ask for advice from seasoned experts. 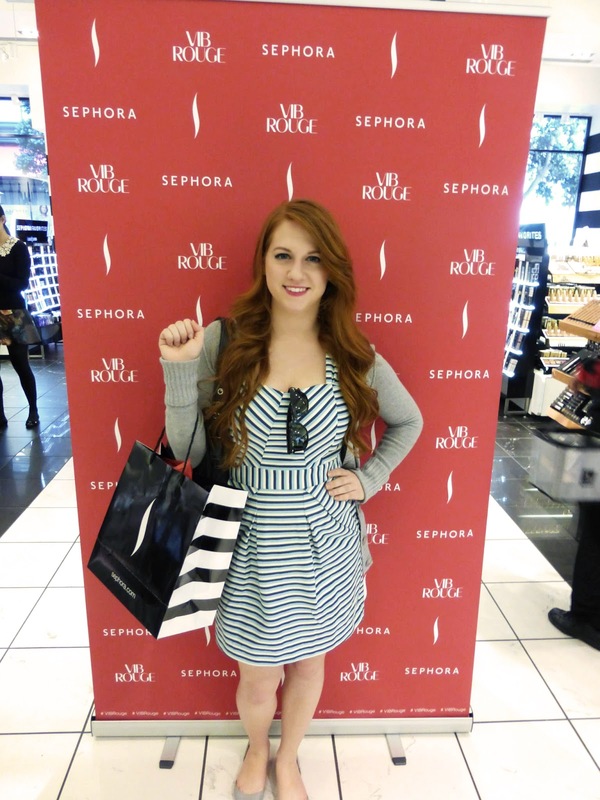 Thanks Sephora for hosting this great event! They also had these cute little photo backdrops for VIB Rouge Members to pose in front of after their mini makeovers. I took mine on my way out, after a happy morning of makeovers and shopping!